Child of Light isn't an indie game. But you'd be forgiven for wondering why Ubisoft's painterly RPG seems technologically unambitious for a game arriving six months into the lifetime of two new consoles. It's for this reason that the side-scroller might pass under a lot of radars. It hasn't got the flash of Assassin's Creed IV nor the muscle of Far Cry 3, yet it's from the studio that created both those games. However Creative Director Patrick Plourde tells TechRadar that things are different this time around, and getting the game off the ground at this point in the consoles' lifecycle was actually a lot easier than it might have been five years ago. "Surprisingly, when I presented the concept I could feel there was a massive change going on regarding the type of content that they would welcome on their platform," he says. "There's no doubt that the success of indies really widened the door of the type of games that are available on the new consoles". That's not to say Ubi's modern-day fairy tale doesn't impress aesthetically; the game's enchanting design is easily comparable to Rayman Legends, which shares the same UbiArt Framework engine. But Child of Light's real visual prowess lies in the details. "One of the things that cost a lot in CPU is the fluid simulation that we made especially for Aurora's hair," says Plourde. "We had to manage the overdraw with the textures, but otherwise the game runs at 60fps on all platforms. On the new consoles the resolution is 1080p while its 720p on PS3, Xbox 360 and Wii U." 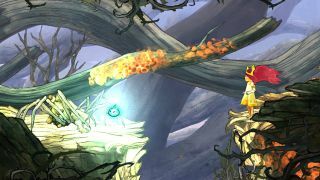 That might not sound like good news for Wii U owners but Plourde believes Nintendo's console will actually be getting the most natural Child of Light experience. "I think it is best suited for the Wii U because of the GamePad actually," he says. "We are using the touchscreen to control the second character, plus you can play in off-TV mode". Where Child of Light is most ambitious is in its balance of RPG and action elements. This mixture of 2D exploration and turn-based combat was inspired by Valkyrie Profile, Plourde tells us, while the combat interruption system takes its cues from Grandia II. And as for the asymmetric co-op play, it was actually Mario Galaxy that helped loosely guide the development team. With combining all of these elements, the game's developers knew they needed something that was accessible but offered enough depth for those who were willing to explore it. "One reason to limit the RPG elements is that we wanted to keep the game short for the genre, around 10 hours, so we made sure that we didn't create too many systems that players would not be able to fully exploit in the walkthrough," says Plourde. It might not delve down to the depths of Final Fantasy's RPG system, but according to Plourde, this is far from child's play. "Accessibility is important but I believe that the difficulty curve is good. The game is surprisingly deep if you toy with it."